What is Wrong With Renee Zellweger’s Face? Home → Across America → What is Wrong With Renee Zellweger’s Face? What happened to Renee Zellweger’s face? She appeared on tonight’s Oscar’s with the rest of the cast from the fim “CHICAGO” and a lot of people were shocked by the changes in her face. 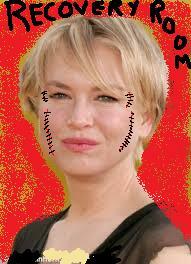 “Renee Zellweger looks like she has had far too much plastic surgery and laser skin peels. Her eyes are stretched and barely able to open. You can tell by the extreme shine on her face that she has had too many things done at the same time. “She also seems to be in pain which would be from laser burn or chemical peels. The shine is from the antibiotic ointments that she must apply to ward off infection now that the skin’s immune response is weak. “Her eyes are uneven and were it not for the fact that the plastic surgery is obvious to me as a physician, I would assume that she could have a touch of the neuro-muscular disease Myesthenia Gravis. One eye muscle is drooping a lot and she should have that looked at if in fact it is not an artifact of the surgery she has had done in her plastic surgeon’s office. My best guess is that she doesn’t have any diseases but if a patient presented to me looking as Renee does and hadn’t had any surgery, this is where I might want to look. There is also a sign in medicine called “lid lag” and she seems to have a variant of it. Usually it’s a sign of thyroid issues, but in Renee’s case it is obviously a plastic surgery related issue. Queen Latifah, who accompanied Renne Zellweger onto the stage, looked a little hefty and slightly different too. This fact did not go unnoticed by Dr. Traherne. “Queen Latifah, seems to have had a bit of work too, but that’s all cancelled out by the fact that looks like she has been gaining a lot of new found weight. She is obese and always has been to some degree with brief times where she has shed a few pounds, but she’s getting older and you can’t carrry around that kind of fat as you get on in years. Queen Latifah’s fat is called ‘viseral fat’ and it’s the most unhealthy form of fat one can have. It leads to diabetes and heart failure. Queen really needs to shed those pounds. It’s all that inner conflict that leads to the accumulation of high cortisol levels and weight gain in the abdomen. Whatever the case may be, Rene Zellweger looks like a Chinese woman who tried to have surgery to look like a very very very white woman — it’s freaking frightening. Did Oscar Host Seth MacFarlane get a hairpice or a toupee or a rug?